Corporate divestments and carve-outs have become increasingly popular and common practice in recent years, for a number of reasons. Ambitious targets to increase the value of companies have been a key driver, as has pressure from well-informed and ever more demanding activist shareholders. Over the past decade, companies have sought to remain agile, flexible and adaptive, to staunchly defend their independence, to act from a position of strength and, simply, to cut costs and/or focus on core competencies. They have thus become more willing to chop and change their business portfolios at shorter notice. Another factor is many firms' strategy of wanting either to be one of the two top players in a given market, or to pull out of the market altogether (witness Uber's strategy in Russia, China and Southeast Asia, for example). Divestments for the above reasons normally involve disposing of an existing business that has everything it needs for stand-alone operation. In contrast, a carve-out describes the separation of a business unit from a corporate group in cases where that unit could not survive in isolation. Selling a branch, sales outlet, branch office or production site to another market player would thus constitute a carve-out. Driven by ever stricter regulatory pressures in the context of M&As, carve-outs specifically to allay antitrust concerns about a proposed wider merger or acquisition have likewise grown in importance. Any M&A that cartel watchdogs believe could threaten fair competition may be required to slim down to prevent one player from attaining a market-dominating position. Unless one or more (attractive) parts of either the acquirer or the target company are carved out and sold off as a "remedy package", antitrust authorities will simply veto the proposed merger. Bayer, for example, was forced to sell agricultural businesses and assets worth USD 9 billion to BASF before it could proceed with its USD 66 billion takeover of Monsanto. Similarly, the European Commission instructed Praxair and Linde to eliminate overlaps between their helium activities as a condition of approval for their proposed merger. And when The Walt Disney Company wanted to acquire over USD 71 billion worth of assets off Twenty-First Century Fox, Inc., the US Department of Justice tied its consent to the prior disposal of 22 regional sports networks. Depending on who the merger partner is, a very clear strategy is needed: Which activities are non-essential and can be dispensed with? And to whom can they be sold? No firm wants to strengthen its rivals, but the circle of potential buyers will almost certainly include direct competitors. In effect, top management must also second-guess how cartel watchdogs might respond to its proposed remedy and anticipate any further demands. Business continuity must, of course, be ensured at all times: during the complex preparatory phase, while negotiations for the transaction are ongoing and after the remedy package has been removed. Administrative procedures must be harmonized and synergies realized to slash overheads and other costs while keeping the business running smoothly. This issue must naturally be tackled in all M&As, but takes on special significance where the target entity must be pruned to satisfy the regulator. The complexity is immense. Alongside the merger proper, it may be necessary to draw up several carve-out scenarios – both on the buyer's side and in the target organization – and keep them available as options. Strict compliance with all aspects of competition law is needed, so absolute secrecy is imperative until the deal is done and dusted. Time pressure is another acute challenge, as a valid buyer with a binding offer must be presented to the antitrust authorities even while work to complete the transaction as a whole is still underway. Perhaps the most tricky issue is actually anticipating and satisfying the requirements of antitrust law and the bodies that adjudicate on it. The challenge, of course, is to keep any remedial conditions to a minimum, which means that companies must peer into the future and see what the balance of market power will look like post-merger/post-carve-out. Working backward from your target entity, reverse engineer the entire process. 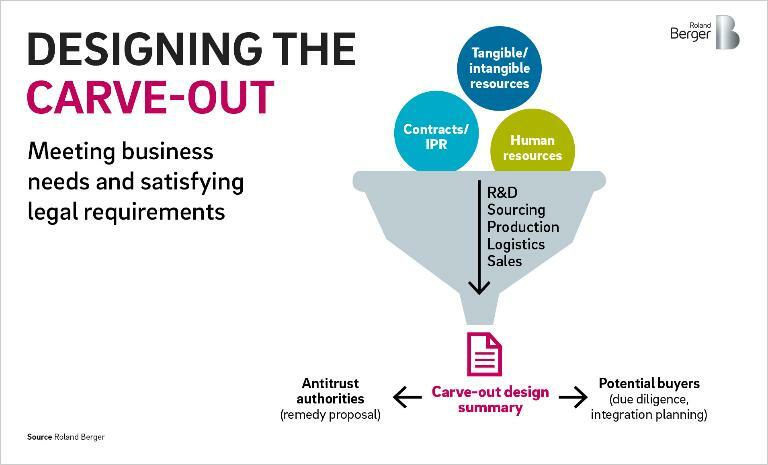 Find a suitable partner for the merger, then scope the assets of the carve-out – as a whole, and at each link in the value chain: Define the scope of human resources, assets and intellectual property to be carved out, along with all necessary service agreements. Also, define a roadmap for potential integration into the unit's new owner. Approach potential candidates and outline the asset package on offer. Conduct a mini-due-diligence investigation, then engage quickly in negotiations to solicit non-binding offers. Depending on the buyer (and the conditions imposed by the antitrust authorities), the asset to be carved out may need to be able to survive on its own. For its part, the buyer must demonstrate its ability to handle the associated economic challenges in the long term. A credible carve-out/carve-in concept and a serious buyer must be presented before the merger can be approved. Open and constant communication with the antitrust authorities is therefore vital to ensure that the powers that be genuinely understand the business and fully grasp your definition of the market. This is also the best way to ensure that the remedy packages you propose fully match the stipulated requirements. On the legal front, too, a solid communication strategy with the antitrust authorities is essential and should be backed by a cogent storyline prepared in cooperation with M&A experts and subject area specialists. Internal legal professionals will naturally play a key role themselves. In practice, however, the focused expertise of external support is vital in the context of such complex transactions. Here again, complexity makes it unavoidable to involve more than just legal experts. Key internal business specialists and experts from the relevant departments must be involved in shaping the carve-out. That said, it is critical to ensure absolute professional secrecy at all times to avoid violating M&A and/or antitrust laws. This structure is crucial to guarantee efficient progress and complete confidentiality. The clean team provides clear governance to the entire process – but needs an equally clear mandate in order to do so. 7. Draw a "red line"
It is essential to know exactly how far you can go before the point of pain becomes intolerable and the deal no longer makes economic sense. That may also have to do with who the buyer is: Even a sensible transaction may prove counterproductive if the carved-out unit(s) could unduly strengthen one of your immediate rivals. Moreover, the red line may shift over time, so it should repeatedly be validated by top management and aligned with the project's current status quo. The current trends to "optimize portfolios" and to "merge and acquire at will" will gain further momentum in the years ahead. And as cartel offices in both Europe and US aggressively defend competition and stay suspicious of anything that smells of market dominance, more and more mergers will include carve-out components and remedy packages going forward. The challenge to companies is to manage the extra layers of complexity this process involves cleanly and systematically – a challenge where professional external assistance can be invaluable. 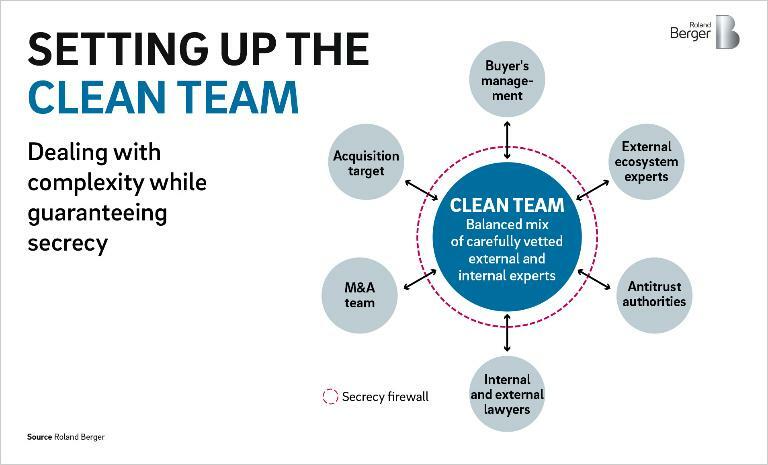 Preparing a full-blown merger and carve-out elements in parallel with the aid of a clean team, simultaneously negotiating with multiple direct competitors and/or investment funds and handling the selling process, all while striving to keep your business running smoothly can directly and significantly influence the value of the target organization, its assets and its potential synergies. Above all, it is therefore important to stay focused and remember that, ultimately, the proposed merger must add value and not dilute it.